On Thursday evening, the AFL advised the clubs of an impending deal with the Victorian Government which would included funding for its Etihad Stadium proposal, and funding for a number of facilities across the state for Womens football. In a $225 million deal with the AFL, the grand final will stay at the MCG until at least 2057, while Etihad Stadium and its surrounding precinct will be upgraded for rectangular sports like soccer and rugby, its women’s change facilities will be improved and there will be guaranteed access for other codes and major events. 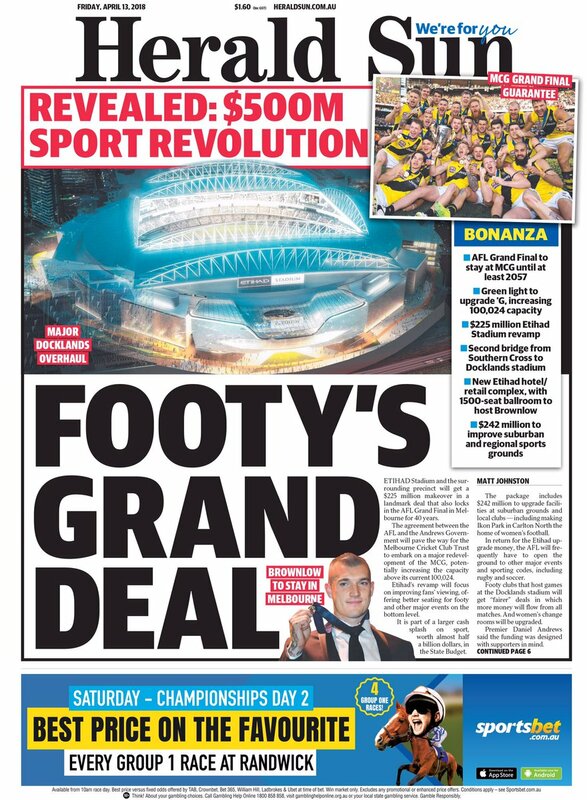 Etihad Stadium and its surrounding precinct will undergo a $225 million revamp under a landmark deal between the AFL and the Andrews government announced on Thursday night. In return for the Etihad upgrade money, the AFL will frequently have to open the ground to other major events and sporting codes, including rugby and soccer. Footy clubs hosting games at Etihad will get “fairer” deals. And women’s change rooms will be upgraded. 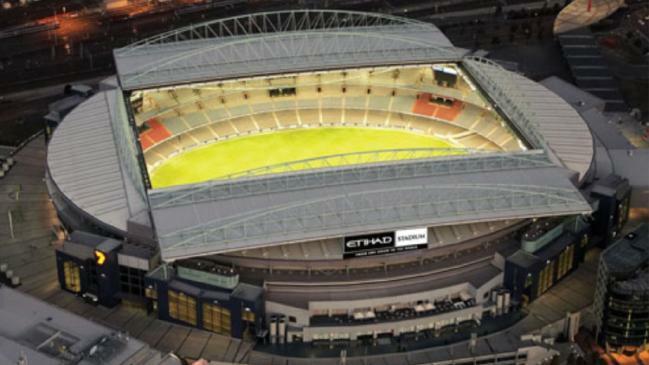 Etihad’s revamp will focus on improving fans’ viewing, ­with better seating for the footy and other major events on the bottom level. A hotel tower on the current site of AFL House isn’t believed to be part of the government funding, but could be funded by the AFL itself. It’s been speculated the new luxury hotel which will help link Etihad Stadium to the Victoria Harbour waterfront will have a ballroom big enough to host the Brownlow Medal and other functions. The agreement between the AFL and Andrews Government will pave the way for Melbourne Cricket Club to embark on a $1 billion redevelopment of the MCG’s Great Southern Stand in about a decade, increasing the capacity above its current 100,024. The MCC is expected to be ready to start the Great Southern Stand redevelopment in 10 years, with the project spanning three years. It is anticipated the capacity will increase by at least a few thousand and as much as 10,000. The current deal for the MCG to host the AFl Grand Final was due to expire in 20137, but will now be extended to 2057. The government said the deal to lock in the MCG as the home of the AFL grand final for the next 40 years would give the Melbourne Cricket Club Trust the financial security to undertake a major redevelopment of the MCG. Collingwood president Eddie McGuire unveiled details of the precinct redevelopment on the AFL Footy Show on Thursday night. Ikon Park in Carlton’s Princes Park is one of the big winners from the funding announcement after being allocated $20 million. The package includes $242 million to upgrade facilities at suburban grounds and local clubs — including making Ikon Park in Carlton the home of women’s football. The budget also provides $60 million for community sporting grants and $5 million for Community Sports Infrastructure Loans. The Andrews government cash splash also includes a $15 million Female Friendly Facilities Fund, $13 million for stage two of the Moorabbin Oval redevelopment and $10 million to improve playing conditions at Casey Fields in Cranbourne and the Whitten Oval for AFLW competition. Ballarat’s Eureka Stadium is expected to be another beneficiary. The small venue hosted its first official AFL match last year when more than 10,000 fans watched a game between the Western Bulldogs and Port Adelaide. Now the boutique location is set to host two AFL matches per year for the next decade. In a push to get more community sports facilities without hurting the Budget bottom line, the government will also open up a $100 million infrastructure loan facility. Under the scheme, which will cost taxpayers $5 million in fees to operate, local sporting clubs from across Victoria will be able to apply for ­interest-free loans to repair grounds or build facilities. The reforms have been decided on because sports ovals and pitches are at capacity in many areas of the state, and some of them are in disrepair. ← Why are we worried about attendances?